Listen to "Drive Time Japanese: Beginner Level" on your iOS and Android device. Learn Japanese anywhere and anytime! 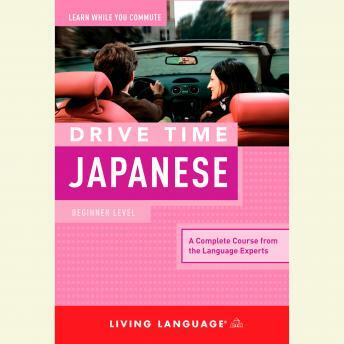 Drive Time Japanese is an innovative language-learning program from the experts at Living Language that lets you learn Japanese vocabulary, Japanese grammar, Japanese pronunciation, conversation and even Japanese culture without a book. This convenient all-audio introduction to Japanese includes 4 hours of language lessons. Learn Japanese while you’re commuting to work, running errands, taking a trip with the family, or even while jogging or working out!